Slacklining is fun, period. But it takes effort, so much effort. Nobody can start walking over a rope like a pro overnight. It needs patience, a lot of it and skill. As it is challenging and takes immense patience, lots of people lost their interest in the first place. Luckily a good slackline with proper features can help you to become a pro quickly. All you have to do is self-believe and practice. If you believe, you can be an expert within a short period of time. Today we are going to show you some of the best slackline options with detail reviews. From here you can easily understand the pros and cons of each product, and you will be able to pick one according to your need. Let’s start the journey without wasting any more of your time. Picking the best slackline with kits is not an easy task as it seems. The market doesn’t have a lot of quality options. Besides, there are tons of cheap quality options with a misleading advertisement. You have to gather a lot of knowledge in order to grab one of the best. It takes time as well. So, we decided to decrease your effort and save some of your time. 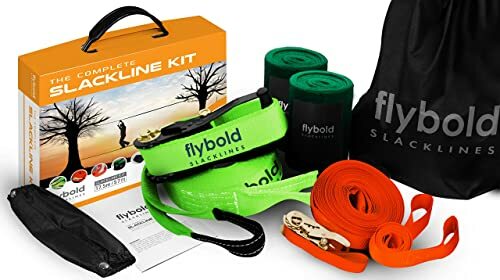 flybold Slackline Kit comes with a whole package. You will get mainline, training line, a ratchet for mainline, and ratchet for training line, arm trainer, ratchet protector, tree protectors, carry bag and a good instruction manual wrapped in a gift box. All, those accessories are available at an incredible price. The walking line is about 57 feet which are well made with 5T break load. The training line is also well constructed for the beginners so that you can develop balance before starting the main game. Besides, the arm trainer will correct your arm position. The line is safe and an amazing option for both learners and professionals. The kit is perfect for backyard family fun and recreation. Even a pro athlete can use it to improve his/her game. The price is reasonable as well. 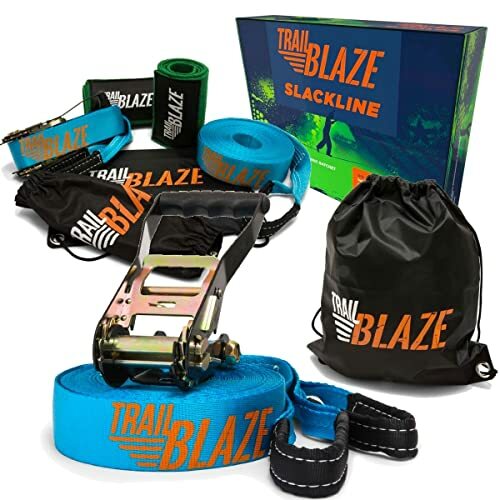 The Slackline Kit with Training Line by Trailblaze is another excellent option with all the essential kits that are well constructed. 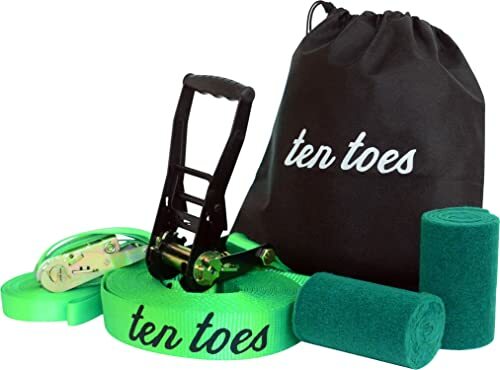 You will get high-quality slackline, premium training line, tree protector, ratchet cover and so many other essential gears for healthy outdoor fun. The construction quality of the slackline, training line and ratchet is premium in quality with highest quality materials. It’s time to ignore those poorly made options. The kit is strictly tested to hold over 300lbs of weight. The setup is easy that takes only a few minutes. The rope provides a full body workout, improves core strength, improve posture, mental clarity and so on. It is perfect for your kids to make him/her active. Overall the price is ideal for such quality. To learn slacklining and develop your balance within a few weeks, the Slackers 50-feet Slackline Classic Set will be your right choice. It is specially designed for the beginners of all ages. The slackline is strongly constructed with premium quality materials. It also comes with a bonus teaching line that will help you in your way to pro! It is a two-inch wide nylon webbing and has ratchet tensioning included that makes it easy to use and setup. The slacklines help to improve core strength as well as balance. Apart from extra training line, you will also get instruction manual where the instructions are perfectly written and a storage bag to store perfectly. The price is reasonable as well. 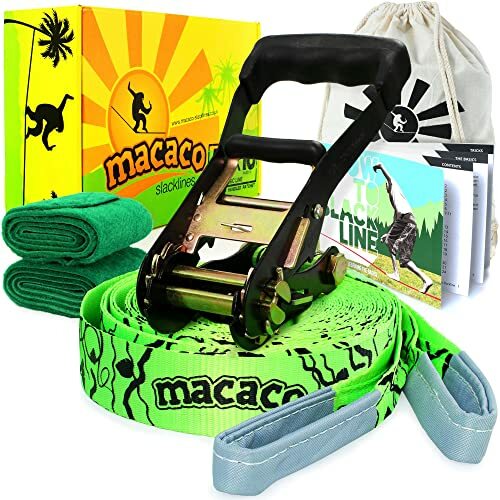 The Macaco Slackline is for everyone. I mean a beginner, as well as expert, can use the line no matter the age or gender. It has a breaking load of 3 metric tons. The slackline performs perfectly for any trick. 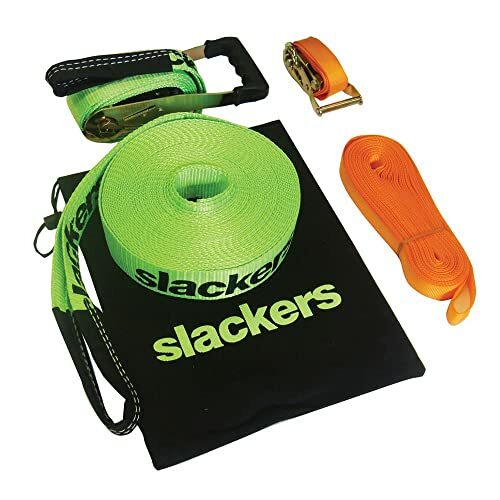 It comes with everything you need for slacklining including a 16m slack specific webbing, sturdy and compact ratchet with ergonomic contoured grip and loop. Besides, you will also get tree protectors, cotton drawstring bag, fire toys as well. It is a new version with lots of new features. The set is designed safely with superior quality. With affordable price and grippe, durable pattern this is one of the ideal and popular lines for beginners. You can have it without any further consideration. 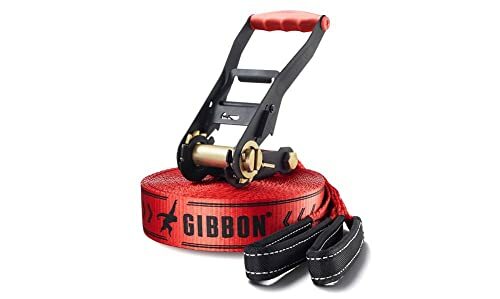 The Gibbon Slacklines ClassicLine Slackline is another excellent option for the price. It is one of the most bought slacklines in the world. If something is most-bought, you can understand how special it is. The slackline is ideal for beginners as well as for experts. The construction quality of the slackline is incredible with premium quality materials. So, it is durable and meets all the requirements of any slacklining competition. It included everything you need to hit the park or any other places between two trees. The slackline is easy to handle with a standard size and width. It offers 49 feet long rope that is 2-inch wide. So, low mounting height will not be a problem. The price is also reasonable. Don’t wait too much; stock may end anytime. 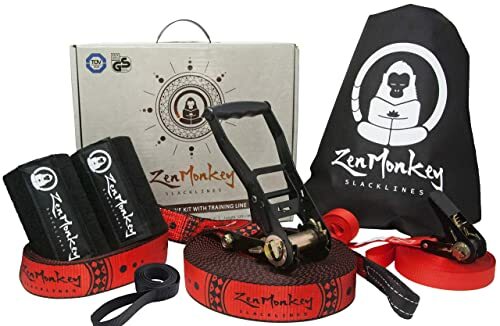 The ZenMonkey has everything a slackliner needs. You will get along slacking with pro-grade ratchet, an overhead training line with ratchet, arm trainer, bark protector set, drawstring cloth carry bag, setup instructions, and user manual. The construction quality is pretty amazing which makes it a step ahead from its competitors. The ratchets are made of structural-grade carbon steel with twin-gears for easy tensioning. So, it is practical and long-lasting. The rope is multi-weave webbing which gives a softer feeling under your foot and specially designed for slacklining. The ratchet is weather-resistant as well. Furthermore, the setup is super easy and safe. It only takes a few minutes. You can surely improve your strength, balance and focus while walking over the slackline. The price is also reasonable. If you love this one, be quick to click the link below and ensure your purchase. It is a highly popular product. So, there is a good chance of stock termination. The setup process is the most frustrating part for slackliners. Thankfully our Beginner Slackline by Goodtimes is super simple to set up with proper one page set up guide. Still, some beginners find it difficult and they said to add a video tutorial. However, if you carefully read the page and concentrate on the picture, the task will not feel complicated. The construction quality of the slackline is fantastic with highest quality materials. Specially designed webbing increases stability and offers a maximum level of safety. 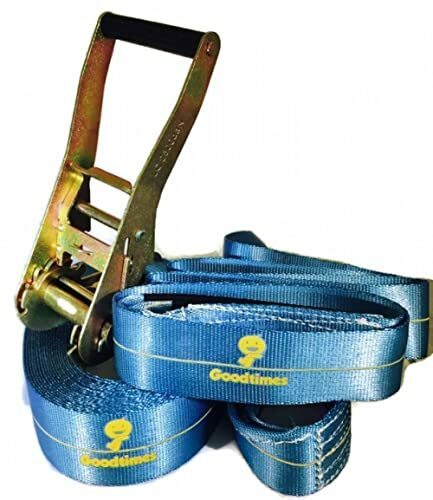 It is specially designed for the beginners and for intermediate level slackliners. You will also get all the essential gears along with slackline on a storage box. While not in use you can store everything well organized and you can even carry the set with ease. Don’t worry the Ten Toes Slackline will never damage trees! The package comes with tree protectors with other essential slackline gear. You will also get a proper instruction manual and a carrying case. So, setup is easy and while not in use you can store it perfectly. The slackline is 2-inch wide, so you can rig it just a couple of feet above the ground. It will surely improve your balancing skill while building your core strength. Furthermore, it also has a training line included that will help you out in your way to become a pro! The slackline has a weight capacity of 250lbs. Besides, it offers practically constructed ratchet. The ratchet is quick-release. Overall, the quality of the slackline kit is exceptional. And the price? Pretty reasonable! Don’t be late; it’s a popular product. The stock may end up soon! 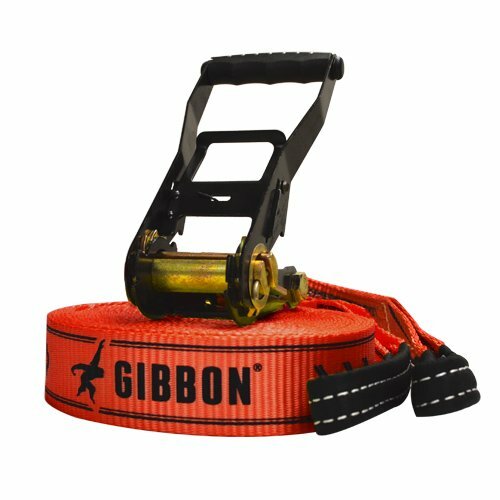 The Gibbon Classic Slacklines are amazing with quality construction. They are designed to last several years without any issue. The manufacturer used premium quality materials for the slackline. However, it offers 50mm width that helps in low mounting height and ensures safe handling. It comes with two part set for quick assembly and disassembly. So, the setup is super simple however some people still find it difficult for the first time. The slackline can take a maximum load of 4t. The price is also reasonable for such quality. Be quick to pick one before the stock expires. We are about to end our article now. And as the phrase says all is well that ends well. So, we decided to finish up the review with something better than best. 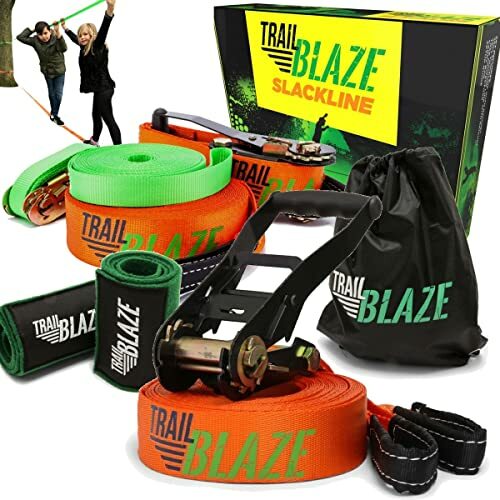 Yes, I am talking about the Trailblaze Slackline Kit which has everything included for a slackliner. The setup is easy and needs a few minutes only. The slackline offers quality ratchet and strong slackline that never frays. It is strictly tested and has the ability to hold about 300lbs of weight. The rope is specially designed for kids. It will provide them with a full body workout in a fun way. The customer rating of the product is pretty high. The price is also reasonable. Besides, it is practical for everyday use. So, why are you waiting for? Pick before the stock expires. That’s all for the best slackline reviews. I am pretty sure you will not find anything better from those 10. All of the products are well constructed, ideal for beginners as well as for pros and also reasonably priced. With those products, you will also get essential gears. Now it’s your turn whether to purchase one of the best or consider some low-quality product. No matter what type of slackline you pick, you have to have the patience to master the technique. You cannot master the technique in a day or two. After a few weeks of practice, you can comfortably walk over a tiny rope. You have to motivate yourself and keep doing no matter how disgusting it feels. Eventually, you will feel better. And let me also remind you slacklining also provides some health benefits too. I am wrapping up for now. If you have anything else to know, feel free to comment. We will try to solve your problem with the best possible solution. Soon we will also cover some other essential product reviews, everyday hacks, tips and techniques with you. Stay connected for that.